It is a question I hear a lot. 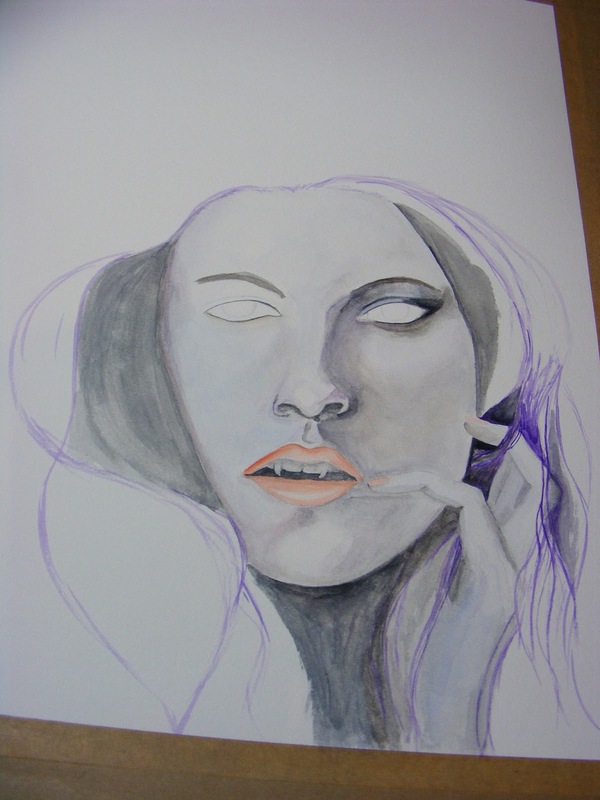 Well, you are in luck as I have just finished a watercolour portrait for Halloween. I have filmed the process so I know exactly how long I took to paint it. I am going to share that process and information with you today. 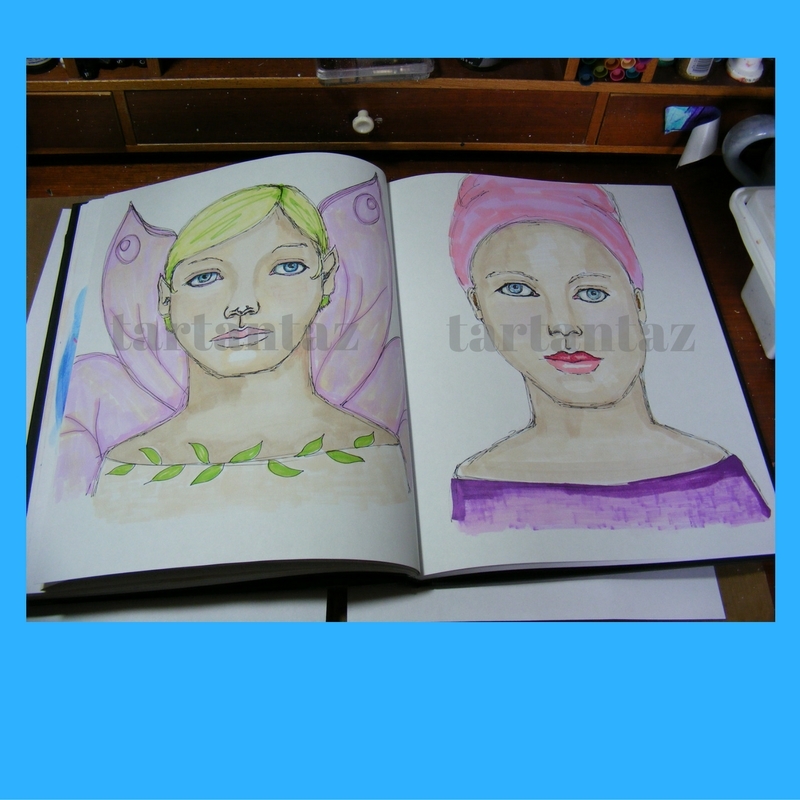 The painting took me 6 hours including the initial sketch and time it took to transfer the sketch. If you would prefer to watch the process scroll to the end where you will find a timelapse video to watch. This is what the painting looked like after the first hour of painting. After I took a short break it was back to work. The following picture was taken after a further one hour of work. So you can see it is not a fast process at all. After taking another short break it was back to work again. This time I managed to get her eyes done and some more definition that is not that noticeable in this picture but it is there and took a further hour to do. Finally after another short break and hour of painting I finally got to a point I was reasonably happy with the face and was able to move onto the background. 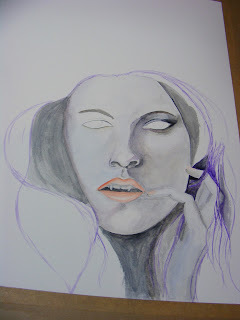 I worked a further hour and a half to finish and define the details on my vampire portrait under the full moon. For those of you who haven't worked it out yet that meant that it took me about 30 minutes for the sketch and transfer of the image. So adds up to 6 hours from start to finish. I hope you have enjoyed learning about the reality of how long it actually takes to paint a picture. How to make your own childrens story book. Back in May 2016, I lead an art collaboration on YouTube. We as a group of artists made bedtime stories on video using our art skills. It was a whole heap of fun to do. Here is how I made the book. If you prefer not to read the instructions there is a video available if you scroll to the end of this post. This is a list of materials I used, you can use what ever alternatives you want to. 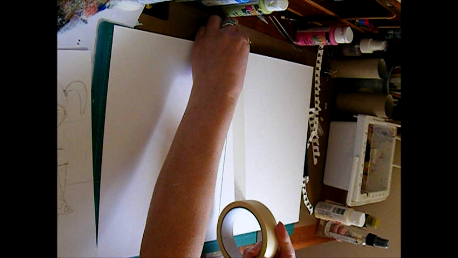 I then constructed the book (trimming off the rough edges before I did so) using masking tape so it could be drawn and painted over if needed. I would place the masking tape over the edge of one page, leaving at least half the width of the masking tape exposed to stick onto a second page. This stuck the first two pages together and the masking tape became the centre fold. So the pages were stuck well together and so there was no sticky parts of the masking tape exposed to stick I taped both sides of the join. It becomes a little more complicated to explain by words now but I will do my best and hopefully with the add of the photographs it will make it clear what I did. Alternatively you can watch the video to see exactly how I did this part. So for the next add of a page. I closed the first two pages as you would a book and stuck the masking tape to the back of the edge leaving half the tape exposed. 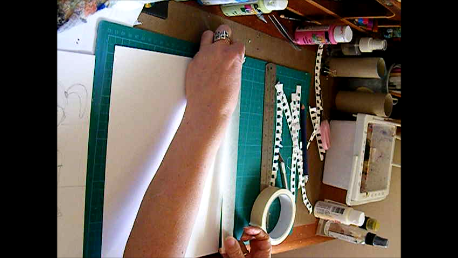 Then placed the next page on top of where it would be if it was a page in a book (in other words it was three pages on top of each other facing the right way) and brought the masking tape up and over the pages. This then gave me the hinge/fold to open the page as if I was turning the page and stick the masking tape down the middle. I repeated this step until there were no pages to add. once the characters were all coloured in, I then hand wrote my story in pencil first to make sure it fitted the page well and then used my permanent ink pen again to write over the pencil and erased all pencil lines, including the guidelines I drew to ensure I wrote my words in a straight line. How do you let go of the need for perfection? After doing so many faces and many of them I was attempting to get life like I became a little focused on perfecting my art work. I decided I needed to let go of my need for perfection. So here is how I did it. 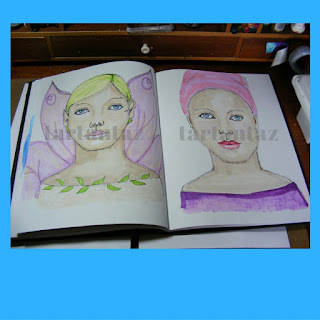 By playing with the concept of abstract in my art journal so I did not need to worry about perfection. In life not just art,it is very easy to get bogged down in needing what we do to be "just right". Even the reason behind me making this video brought out my inner critic. As this video was for a YouTube collaboration with other artists, my inner critic was telling me that I had to do a really good bit of art to not look out of place in this group of artists. For some reason my inner critic (we all have one) was telling me that in order to be noticed/liked/succeed in this collaboration what I did had to be "amazing" Sound familiar???. So when I noticed my inner critic was telling me my art is not good enough if it is not perfect, it was time for me to silence it, to let go and just have some fun. 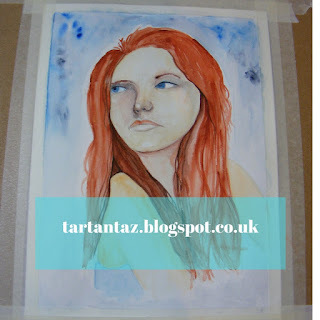 For me that meant ignoring my inner critic, not thinking too much about what colours I used, or what brush stroke I used, or even whether or not I blended the paint in, worked a treat. This journal page is beginner friendly so why don't you watch how I did it and try for yourself. Hi folks in todays post are my final pictures for the 29 faces. As a couple of the faces have been influenced by Jane Davenport, who I discovered online, I talk a little bit about her influence on me, including my opinion of her book Beautiful Faces. If you have any questions please ask in the comments below. If you are someone who has also been influenced by Jane Davenport, I would love to hear about it in the comments. I am also interested in any other influences others have in the world of creativity, why not share who influences you in the comments. I have been taking part in the 29 faces art challenge which finished on 29th September. Here are the final 4 faces I have completed for this challenge. The last 2 faces were a follow these instructions activity contained with in the Jane Davenport book Beautiful Faces. As seen here on my desk. I bought this book about a year ago on Amazon. 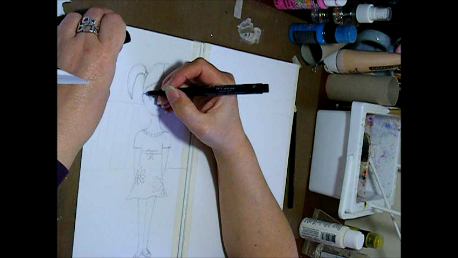 I dip in and out of it whenever I need a little boost to my creative mojo. You may have heard that it is "bad" to copy. Well, of course there are copyright rules and you would want to follow these. This is a large topic and I will not be going into the details right now. Essentially, you are not allowed to reproduce another persons work without permission, whether that be art or photographs or even writing. You might now be asking how do I find a reference to draw from. Well the solution is to either take your own photographs or you can always go to paint my photo and find a reference photo there. For the purpose of my post today the book invites you to follow the instructions so I would like to thank Jane Davenport and her book for giving me the instructions and inspiring me to produce work that is not an exact copy but is clearly influenced by her work. This book has an information section and activity on pretty much all types of media known. There are clear instructions on how to draw a face at any angle and focuses in on each of the individual features of a face. 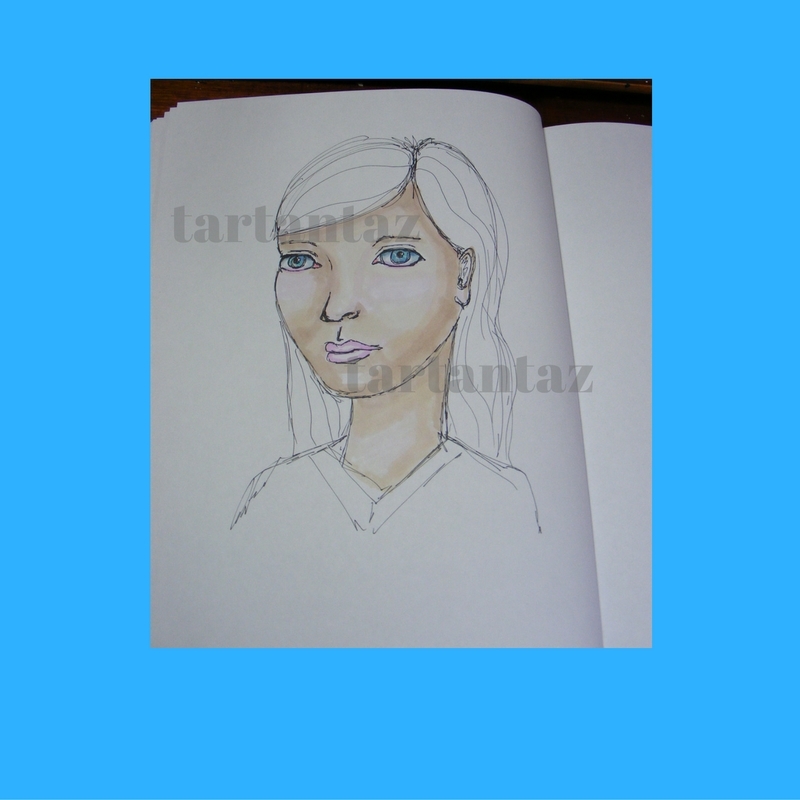 Although the style of art in this book is primarily whimsical, there is also some instruction on what a realistic face proportions are. It is a very good book and I would highly recommend it to anyone who is interested in drawing and painting faces, particularly whimsical faces. The book has not been the only influence. 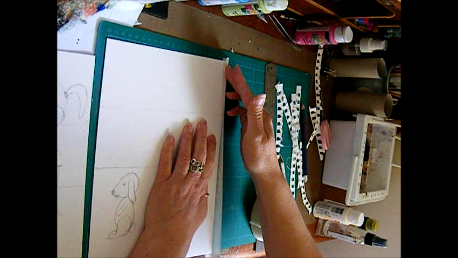 I first found Jane on YouTube where she has a number of art lesson videos. These are a great introduction to the media she is demonstrating. The downside is to learn more you need to buy her art classes. The only classes I have experienced so far are the classes Jane has done for Lifebook2016 ( by Willowing arts) These lessons were such an inspiration I just got out my supplies and began arting along. Not all classes do this for me. Taking more of her classes is on my to do list. Thank you for visiting. I would love to hear what your influences are, so why not leave me a comment. GI was about to head to bed about 9pm when I was struck with the inspiration bug and so I just had to do some painting before I went to bed. Little did I know I would still be up at 1am in the morning, ooops. I am rather pleased with the outcome though, so maybe it was worth staying up just that little bit later to produce this lovely watercolour painting. What do you think? You can always let me know what you think in the comments. Is art worth staying up for sometimes?